The Orionid meteor shower will peak this weekend, with the best morning likely being Sunday, October 21. Try watching on the mornings of October 20 and 22, too. In 2018, the glare of a brilliant waxing gibbous moon interferes for much of the night. There is a window for dark-sky viewing during the shower’s best hours, shortly before dawn. Some experts are expecting a possible upswing in Orionid activity in 2018. Who knows? If you’re really lucky, you might see more than the predicted 10 to 15 meteors per hour. These meteors – vaporizing bits of comet debris from Halley’s Comet – look like streaks of light in the night sky. They’re sometimes called shooting stars. From late Friday to Saturday morning (night of October 19-20, 2018), there’s less moonlight to obstruct the show. For instance, at mid-northern latitudes in North America, the moon sets roughly 4 hours before sunrise on Saturday, October 20. On Sunday, October 21, the moon sets about 3 hours before sunrise. On Monday, October 22, the moon sets only about 2 hours before sunrise. Orionid meteors radiate from the constellation Orion, shown in this photo from October, 2016, by Zefri Besar in Brunei Darussalam. Want to know exactly when the moon sets in your sky? Or when morning dawn (astronomical twilight) first begins? Click here and remember to check the moonrise and moonset plus the astronomical twilight boxes. Remember, you don’t need any special equipment to enjoy the show. Find an open sky away from pesky artificial lights, enjoy the comfort of a reclining lawn chair and look upward. 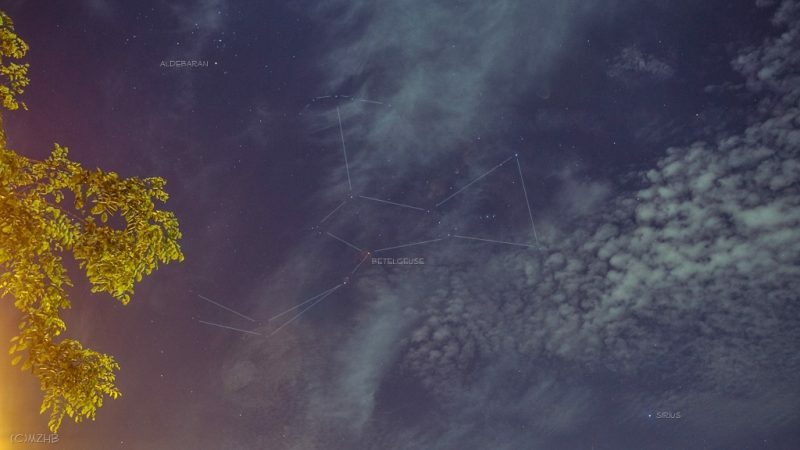 Find dark locations at EarthSky’s stargazing page (zoom out for a worldwide view). Just be sure to give yourself at least 20 minutes for your eyes to adapt to the darkness. And you’ll want at least an hour of viewing time. That’s because meteors often come in spurts, followed by lulls. 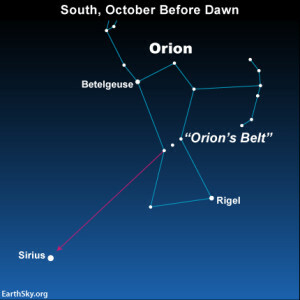 While looking for the Orionid’s radiant point, know that you can extend Orion’s Belt to locate Sirius, the sky’s brightest star. Where is the radiant point for the Orionid meteor shower? 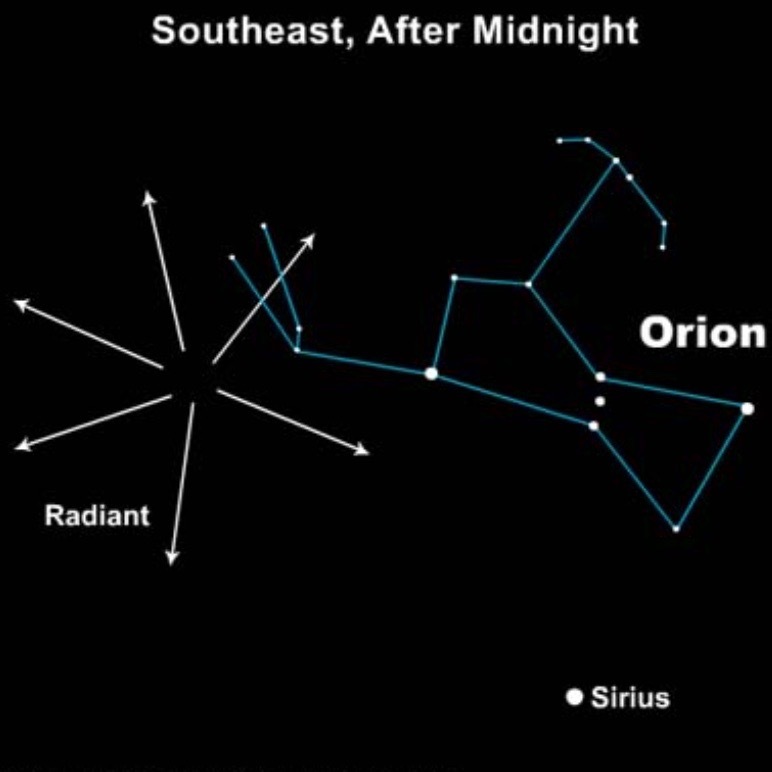 The radiant point for the Orionids is in the northern part of Orion, near Orion’s Club. Many see the Hunter as a large rectangle. You’ll surely notice its distinctive row of three medium-bright stars in the middle: those stars represent Orion’s Belt. 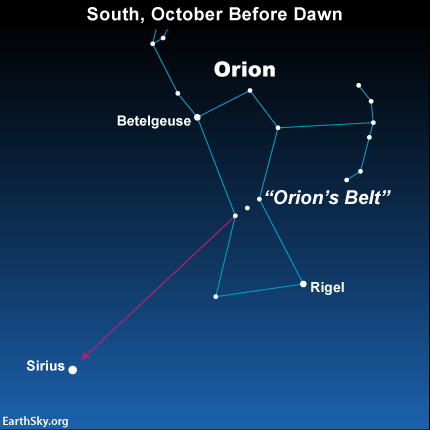 The brightest star in the sky, Sirius, is to the southwest of Orion on the sky’s dome, and the Belt stars always point to Sirius. This constellation is up in the southeast in the hours after midnight and it’s high in the south before dawn. We will have much more to say about Orion in the months to come, because it’s one of winter’s most prominent constellations. Do you need to know Orion to see the meteors? Nah. The meteors appear in all parts of the sky. But if you trace the paths of the meteors backward, you’ll see they all seem to come from this constellation. How many meteors can you expect to see? The number of meteors you’ll see in any meteor shower always varies greatly depending on when and where you watch. Meteor showers are not entirely predictable. That’s the fun of them! In a dark sky, you might see about 15 meteors per hour, or one meteor every few minutes, during the Orionid peak. When should you watch for Orionid meteors? Meteor showers aren’t just one-night events. In fact, they typically last several weeks, as Earth passes through a stream of debris left behind by a comet, in this case, the famous Comet Halley. 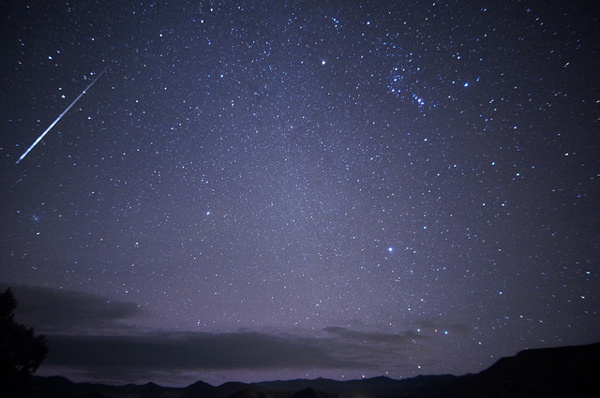 According to the International Meteor Organization (IMO), the Orionids often exhibit several lesser maxima, so meteor activity may remain more or less constant for several nights in a row, centered on a peak night. So, before dawn on October 22, the Orionids might match – or nearly match – the numbers before dawn on October 21. The Orionid meteors generally start at late night, or around midnight, and display maximum numbers in the predawn hours. That’s true no matter where you live on Earth, or what time zone you’re in. If you peer in a dark sky between midnight and dawn on October 21 or 22, you’ll likely see some meteors flying. Some might be bright enough to overcome the moonlit glare. What should you watch for during the Orionid shower? If you’d like to make a new friend, or revisit an old one, enjoy the company of the constellation Orion – the radiant of the Orionid meteor shower – on this dark night. Orion rises in the east at late evening, fairly close to midnight. Surrounding Orion are the bright stars typically associated with winter evenings in the Northern Hemisphere. There are many bright stars in this part of the sky, and they are beautiful and colorful. Want to try to identify some? Your best bet is a planisphere. Possible Orionid meteor moving by the Gemini stars Castor and Pollux. The constellation Orion the Hunter is found at the upper right and the star Sirius below Orion’s Belt. Image via Mike Lewinski. Bottom line: A bright moon interferes for much of the night for the 2018 Orionid meteor shower. Watch shortly before dawn, after moonset. Try watching on the mornings of October 20, 21 and 22. A dark sky is always best. Have fun!